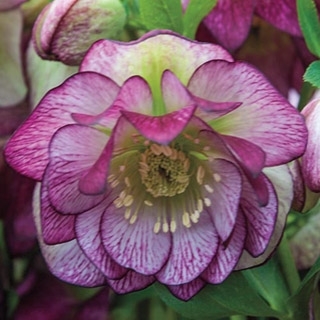 This hellebore’s fluffy, double flowers are a gentle pink with a darker pink picotee edge delicately veined in varying degrees of peppermint. Dark pink backs are revealed as the cup shaped flowers gracefully hang down, and the color holds even after the flowers set seed. Evergreen and deer resistant. A native of the Alps, this cultivar of P. auricula is a lovely and fragrant addition to any spring garden. ‘Bartl' primrose features dainty soft purple and white blooms above a rosette of evergreen foliage. Tuck it into the rock garden, grow it on the patio, or plant whole rows into trough planters. Compact and exceptionally long-blooming, 'Love Hearts' is a splendid new Bleeding Heart for the shade garden. Its white, heart-shaped flowers are accented with purple, and are carried above ferny blue-green foliage. Freeman’s Toadshade is a native Trillium discovered near the remote north Alabama town of Cairns (Morgan County) at 900' elevation. The leaves are nicely patterned silver and green and the violet purple petals range from narrow to wide. A pink form of spring-blooming Candytuft. Sweet pink flowers mature to lilac and blanket neat cushions of dark green foliage. The foliage remains attractive year round. Iberis is perfect for cascading over rock walls or edging. After flowering, lightly shear the plants to keep them neat and bushy. Coral Bell bling! Polished silver foliage glistens on tidy mounds. Contrasting black veins radiate pleasing patterns against mirror-like leaves. Bouquet-like sprays of fuchsia pink flowers dance above glamorous foliage. Capture the blazing glory of sunrise with this sensational tall bearded iris! The golden center mimics the sun, streaking out into cloud-white standards and burgundy falls. The impressive stems exhibit strong three-way branching and produce as many as 7 buds! An iris that is intensely showy and dramatic, both in the garden and in the vase. Another beautiful hardy geranium for the garden! This geranium has a wide open habit, 14" tall x 18" wide, and large blue-lavender flowers with a distinctive white central pattern that contrasts nicely with the dark stamens. Lovely, compact and long-blooming, Clematis Neva is well suited to growing in containers or at the front of the border. Allow it to spill over a low wall or scramble among the perennials! Rich pink to light red flowers can bloom on this excellent hybrid for 5 month of the year. Very free flowering! I hope this list inspires you to add a few new varieties to your spring garden! Our monthly newsletter is filled with gardening tips, plant profiles, and information about garden events. Copyright 2019 by Enchanted Gardens.